DGLs are one-use, usually one-shot disposable grenade launchers. They can be used alone but are generally attached to a mounting such as the accessory rail of a rifle. Originally used for grenades and shotgun-like loadings they are now often encountered loaded with 40mm mini-missiles such as the ILCAS-40 Swift series. The Swift series was designed to engage personnel, cybershells, obstacles such as machine gun positions and lightly armoured vehicles. Most DGL launchers use high-low pressure mechanisms, spigot configurations and captive pistons to achieve a flashless and low-noise launch signature. Mini-missiles are soft-launched, the rocket igniting and accelerating the round several yards beyond the muzzle. The launchers are constructed from lightweight alloys and polymers. Typically they have a small folding grip that protects the trigger. They can also be fired electrically. · They can be attached to weapon accessory rails to serve as underbarrel or sidebarrel launchers. Military users often reserve space on a rail for one or two DGLs to be fitted and carry additional reload DGLs. If the weapon has suitable fire control it can program fuse settings. · DGLs may also be mounted directly on power armour, battlesuits or cybershells. Many military vehicles mount clusters of DGLs for smoke screening or local defence. · Many vehicles use DGLs offensively mounted in armoured boxes to give an intermediate level of force between machine guns and main weapons. Crew-served and vehicle-mounted weapons either mount DGLs on the weapon or on brackets on the mounting or tripod. A machine gunner, for example, can fire mini-missiles to airburst over enemies he has driven into cover. · Multiple DGLs can be fitted to small baseplates mounting between three and twelve launchers. Each mounting is adjustable to vary aim and elevation. Such systems are used for area defence, illumination and for ambushes. · The “Six-shooter” is a dedicated grenade launcher that mounts up to six DGLs on a stock with a fire control system. A bipod may be fitted to this system. A simpler, more compact launcher mounts just two DGLs. Some platoon leaders favour a double barrelled 20mm micro-missile launcher with a rail and FCS for a DGL. 40mm mini-missiles are an alternative to 30mm systems. They are designed for high-subsonic velocities, giving them an advantage over the supersonic 30mm mini-missiles in both range and capacity. A DGL launch tube weighs 2.2lbs and contains a single 40mm mini-missile. The first 40mm mini-missiles were fielded in the early half of the 21st century. They took the form of unguided rounds that were stabilized so that they would fly in a straight line, compensating for the effects of wind and drop. As technology advanced laser-homing and then homing mini-missiles variants became more common. The Swift mini-missile is steered by a combination of thrust vectoring and a gimballed nose-cone. From the start mini-missiles were designed to use programmable fusing. The shooter lased the distance to the target and the missile was programmed to detonate at a certain distance. The fire control system (FCS) would also track target speed and direction and provide the shooter with a corrected point of aim. Initially mini-missiles were used with dedicated “Grenadier” model rifles fitted with a fire control system that could program the fuse system. If used without such as system they defaulted to stabilized, impact-fused munitions. By 2100 fire control systems have become so compact and cheap that most Fourth and Fifth wave military rifles, SMGs and machine guns have them fitted as standard. The flat, straight trajectory of the mini-missile allows an engagement range in excess of 1,300 yards. Average velocity is 295 yards per second. 40mm mini-missiles have an arming distance of 10 yards (5 if a HEAP/ shrapnel round set to “cone”). If they hit a target within this arming distance they will not detonate. Since they have not yet accelerated to full velocity they will only do 2d cr damage. Below are a selection of the more common or more interesting DGL and 40mm mini-missile loads. Transhuman Space technology such as minifacts or 3D printing make it feasible that alternate rounds can be created. As a guide, a 40mm mini-missile has a capacity of about half a pound of explosive, or twice that of a modern 40x46mm grenade round. This is also the likely capacity of a DGL grenade round. Treat these non-mini-missile rounds as having a similar size and range to a rifle-grenade. Impact: This is the default mode should the fuse not be programmed for some reason. It is also used for direct attack against well protected targets. In actual fact the fuse sensor explodes the round slightly before impact for optimum explosive penetration effect. Damage 6d x 5(10) cr + linked 3d cr ex [1d+4]. Main (non-explosive) damage in all cases is incendiary (see p. B105). Blast radius 6 yards, fragmentation radius 5 yards. Airburst: The firer lases the distance to a target and the round is automatically set to explode when it reaches this distance. Treat as an airburst, 3d cr ex [1d+4], blast radius 6 yards, Fragmentation radius 10 yards unless something is in front of the round within the effect area. In that case the object or person also takes 6d x 5(10) cr from the shaped-charge effect. Window: The round explodes 1.5 yds beyond the lased distance. This lets the round fly though an opening and explode within a room or just beyond a wall it is fired over. Treat as an airburst, 3d cr ex [1d+4] blast radius 6 yards, fragmentation radius 5 yards. Delay: Allows the round to punch through light cover or vegetation before detonating. Use 6d (0.5) cr verses any resistance. Treat as a normal impact or airburst detonation if it penetrates cover or comes to a stop. HEAP was once the most widely used form of 40mm mini-missiles. It is still often issued in conflicts where cybershells and battlesuits are relatively rare and the usual targets are humans or bioroids. It was formerly common practice to use HEAP for most shots, keeping HEMP loads until a suitable target presented itself or all the HEAP had been used. The round is programmed to explode at a set distance from its firer. It can be set to Window or Delay modes like the HEDP variant. If for some reason the round does not get programmed it defaults to impact detonation with a cylindrical blast pattern. HEAP is effectively a shrapnel round. To be more accurate, it is a modern version of the Krupp Universal Shell. Steel balls are packed around a rod of explosive with an ejector charge at the base. The round casing is prefragmented. The HEAP rocket has two modes, depending on whether the ejector charge or the central bursting charge is triggered. If the main central charge is detonated the round scatters shrapnel and casing fragments in a roughly cylindrical pattern. Treat as a rectangular airburst 10 yards to each side and 4 yards to front and rear. 7d cr ex [2d+1]. This counts as an airburst attack to an area (+4). On a miss use scatter rules (p.B414) to find where the round ejects its shrapnel. Shrapnel is ejected in the opposite direction of a line drawn from the ejection point and the firer. When the basal ejector charge is triggered the round behaves like a flying claymore mine or a blast of grapeshot that forms a 30 degree cone, 1 hex wide at its origin, 3 hexes wide at 6 yards. The round is usually targeted and programmed to eject in a hex 7 yards ahead of the intended target. Treat range of cone blast as 30/600 and damage as 1d-1(0.5) pi. The round contains 100 balls so treat as +7 bonus to hit against any targets in the cone. Range modifiers for the shrapnel load are from the hex the round ejected in, so potential targets 7 yards away are -3. The 40mm SEFOP warheads are only available for homing projectiles. They are fired to overfly the target and may be set to either attack the side they are facing or the top, targeting particular hit locations (usually the head of a person or a tank turret), and ignoring cover that does not protect from above or penalties for striking prone or kneeling targets. 6d x4+20(3) cr. Target Indicator mini-missiles begin to emit coloured smoke when 40 yards from the launcher. This continues for 12 seconds so the round will continue to emit smoke after it has impacted its target. The target it therefore marked by a column of smoke and a streamer of smoke leading towards it. More sophisticated variants use homing or laser-homing. 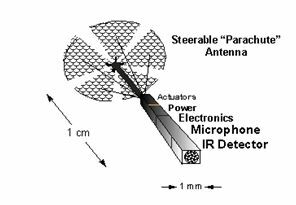 An indicator mini-missile may also incorporate a radio locator beacon and/or an LED strobe-light for operations where the smoke is unlikely to be visible. A 40mm mini-missile with a tangler warhead will cover a 2 hex radius. A DGL loaded with a tangler grenade is likely to be less accurate and shorter ranged but have a larger capacity so will affect a 4 hex radius. Incendiary mini-missiles are mainly used for sabotage or despoilment (destruction of supplies) so are not standard issue. Of course, in 2100 such things can be easily minifactored when needed. Incendiary missiles are likely to contain thermite or/and Thickened Pyrotechnic Agent (effectively napalm!). See High Tech (4e). The surveillance mini-missile delivers a small cloud of surveillance fluff (above) to an altitude of 2,000ft above a point up to 1,100yds distant. This round is an unguided grenade rather than a mini-missile. It will detonate at a pre-set distance from the launcher, setting being applied manually some time before use (requires a screwdriver or similar). Vehicles use these rounds for local defence and set them to explode just a few yards after firing. Several may be loaded into a multiple launcher and used to bombard an area. 5d [2d] cr ex. Max range 165yards. This round is usually a grenade rather than a missile. Launchers loaded with such rounds often form part of the self-protection suite of vehicles and large cybershells. Infantry also use them for screening. The round contains 18 plastic-covered wedges, each containing a quantity of smoke composition. The grenade is fired so that the casing breaks up just above the intended target and the wedges are scattered over that area. A catalytic reaction causes each wedge to rapidly produce smoke resulting in a rapid, dense build-up of cloud. Grenade break up and cloud production are designed to be flameless to minimise the likelihood of unplanned fires. The smokescreen round is commonly available with various smoke compositions including prism and hot prism. It requires 9 doses of chemical and one grenade covers a 10 yard radius. Cloud duration 300 secs divided by windspeed in mph. Max range 165 yards. More recent versions use PFOG technology. The projectile used in the smokescreen DGL is also available as a Rifle/Hand Grenade. The Rifle/Hand Grenade can either be hand-thrown or launched from a rifle-muzzle. In the later mode it is a bullet-thru design so can be projected by standard 5mm, 5.6mm or 6.6mm combat rounds rather than specialist ammo. The smoke R/HG is often preferred to the smoke DGL due to its greater versatility. Treat as weight 1lb for throwing by hand. Rifle-launch max range 165 yards. A fragmentation version of the Rifle/Hand |Grenade is also available. 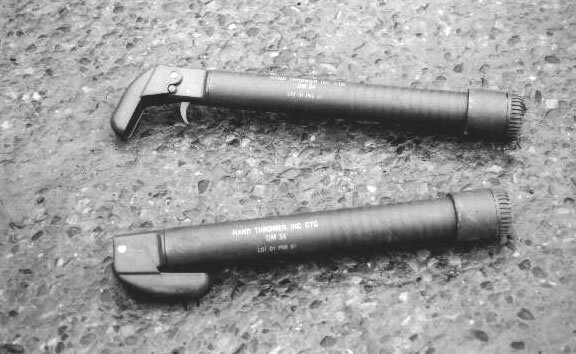 Flares are available in DGL format but generally they are hand-fired rather than weapon-mounted. The standard illumination flare is a 38mm parachute flare that illuminates a 185-yard radius for 40 seconds. If fired directly at a target at close range, before it deploys and lights, it inflicts 1d+1(0.5) cr dkb. A burning flare does 1d of burn damage every second it is in contact. Available in white, red and infra-red enhanced. Day and Night Signal flare. At night is visible as a white or coloured star intended for signalling rather than illumination. The burning of the star also produces a streamer of smoke in the same colour that is more visible in daylight. An X-shaped parachute keeps the flare in the air longer and reduces the chance of the flare landing still burning. The parachute is also designed to catch in tree tops allowing personnel in woodland or jungle to signal. The flechette DGL fires multiple projectiles rather than a single grenade or missile. It is designed for close range combat, each launcher containing 160 flechettes which are fired in a 10° arc. Flechette DGLs are often used for booby traps or as command-detonated mines. A 10° arc is 3 hexes wide at 17 yards, minimum width 1 hex. Treat as a single-use shotgun. Dmg 1d-3 pi-, Acc 2, Range 100/1,200, RoF 1x160 , Rcl 1, Bonus to hit +7. The anti-ambush round contains buckshot followed by a small grenade containing smoke pellets and preformed fragments. Treat as a single-use shotgun. The buckshot load does Dmg 1d-1(0.5) pi-, Acc 2, Range 30/600, RoF 1 x 20, Rcl 1, Bonus to hit +4. The grenade is fired at the same location (to a maximum of 60 yards) and does 6d cr ex [1d] and produces a 6 yard radius smoke cloud for 12 seconds. This round uses the same components and mechanism as the smoke screening round but releases riot gas instead of smoke. The wedges scattering over a large area makes it very difficult for rioters to smoother them before the gas affects them. The flameless design features minimise collateral damage. A riot gas grenade requires 9 doses of chemical and one grenade covers a 10 yard radius. Cloud duration is 300 secs divided by windspeed in mph. Nanodrugs or chemicals other than riot gas may be used instead to produce other effects on the targets, for example Cry Baby (TS:CT p66). The RAB is a riot control munition mounted in a DGL. The ring aerofoil projectile generates lift as it flies so follows a relatively flat trajectory. It is a kinetic energy round designed to engage rioters at relatively long ranges. It is usually used to target ringleaders or particularly aggressive individuals. The RAB does Dmg 1d+1(0.5) cr dkb, Range 120. Marker dye and/or one dose of malodorant chemicals may also be included in the projectile. A multiple projectile kinetic energy crowd control round for short range use. Contains a load of polymer pellets and two larger polymer balls. Intended to be fired at the legs and lower body, the weapon's AI may prevent the shooter targeting the head region. Treat as a shotgun firing a two shot burst at the same target. Rounds such as these are often fired at the ground ahead of a crowd. When this is done randomly determine the hit location on the body adding a modifier of +2. The large balls are Dmg 1d+1(0.5) cr dkb Range 10/110, Rof 1x2, Rcl 1. If the required hit score is exceeded by one both balls have hit the same target. The smaller pellets are Dmg 1d-3(0.2) cr, Acc 2, Range 20/120, RoF 1 x 48, Rcl 1, Bonus to Hit +5. Stormtubes are an alternate model of disposable launcher originating from Australia. Like DGLs they are preloaded and disposable and are used on accessory rails and other mountings. Stormtubes use a superimposed load system that has several projectiles loaded sequentially in a single barrel. The rounds can be fired individually or all at once, subject to the user's tolerance of recoil. A variety of calibres are offered but a typical Stormtube would carry three rounds, each equivalent to a 40x46mm HEDP grenade. Programmable fusing is an option for these rounds if the mother weapon has suitable FCS. An alternate model of stormtube might carry five 20mm micro-missiles or shells.